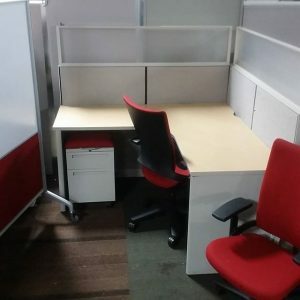 Michalsen Office Furniture has been selling and servicing new, used, pre-owned and refurbished office furnishing and moving needs in Illinois and Wisconsin for over 30 years. Whether you are a small business or a large corporation, whether you need a single workstation or 100-plus cubicles, Michalsen Office Furniture has a large in-stock inventory that delivers shopping satisfaction at bargain discount pricing. As well as the workstations, cubicles, and modular units that fill over 50,000 sq. ft. of warehouse and showrooms, you’ll find new, used, pre-owned and refurbished office and task chairs, desks, files, conference and work tables, all at a selection of discounted pricing to fit either immediate or projected budgets and needs. Design and planning, installation, buy back, office moving and teardown, painting and refurbishing services are available for small or large businesses, from individual to corporate, for shop, factory, church, school, government or home locations in northern Illinois and southern Wisconsin, from Chicago to Rockford, from Madison to Milwaukee.